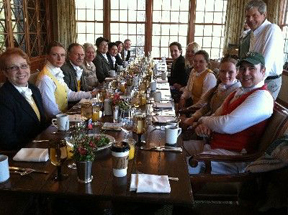 The English hunt and American hunt breakfast are as much a part of riding to hounds as the stirrup cup. In days of olde, around 1890, gents of the leisure class in England spent their days fishing, hunting birds on shoots and, of course, hunting. A long day spent topside a horse called for solid sustenance and the English country breakfast was usually taken with a plethora of weekend county house guests who came for the food, entertainment and of course good sport. The ladies, unless they hunted, stayed in bed and had their breakfast brought to them by a maid. The gents gathered in the dining room and enjoyed tables and sideboards groaning with such things as broiled kidneys, pulled fowl, sheep’s tongues, potted pigeons, hams, woodcocks and thrushes. Not quite what we are used to eating today. Fast forward now to the days of Downton Abbey in the Edwardian era, which started from Queen Victoria’s death in 1901, went until 1910 and was so named after her son Edward VII. 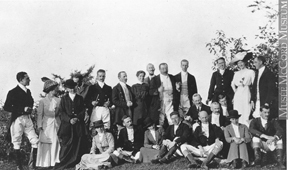 With the Edwardian era came marked change in British society however, all the upper class perks were not lost although many of the country estates held weekend get-togethers with a slightly diminished staff after WW I. Women never look so well as when one comes in wet and dirty from hunting. The weekend guests who were setting off for a day of hunting fortified themselves with fruit cake or a “hand cake” and port. Those who arrived from outlying estates would be served food and drink on the lawn by the staff and they too would enjoy the easy to handle and eat fruit cake and a glass of port or sherry. One drink that was very popular and is now known as The Wimbledon drink, was a Pimm’s Cup which originated in the 1800s at an oyster bar in London’s financial district by bartender James Pimm. (See recipe below). Now we gallop onto more modern times. One photo I found circa 1960 shows how a table might be set for a small hunt group before setting out. The table is antique and old as is the silver and the centerpiece features a tall silver trophy with snaffles and stirrups artfully arranged around the base. The sideboard shines with mint julep cups, there are old hunting prints on the walls and more silver trophies on stands are in front of the long windows. There are small individual crystal decanters dotting the table and the stemware, silver flatware and equine motif china offer a warm welcome to the guests. Members of The Tennessee Valley Hunt enjoy a hunt breakfast. Courtesy of Gretchen Pelham, MFH. In today’s world a hunt breakfast is usually considered something to enjoy after the hunt. ..the dine after the dash. There is nothing nicer than a get together with friends after exhilarating gallops across fields and meadows interspersed with jumps and ditches as hounds give tongue. The shadows are lengthening, the horses are safely tucked into their stalls and the pleasure of the hunt breakfast is still ahead. The host and hostess have put their best feet forward and while the menu may vary from week to week, in this day and age one might find scrambled eggs, home fried potatoes, chile, baked glazed ham , French toast and chicken and mushroom crepes on the tables. Oh, and spirits of course to ward off the impending aches and pains. For the flower décor, this is the time to forget about tiny posies and delicate arrangements. Bring on the old silver trophies and earthy toned vases and fill them with the colours and textures of the meadows and fields: Cascades of vines, thin branches of red, orange and yellow maple leaves and the plumes from ornamental grasses will bring the outdoors in, or if you are lucky enough to be breakfasting al fresco, they will blend in with the rampant fall colours. However, while the menu, table settings and décor may have changed over the years, the topics of conversation will probably never change: Some talk about the bravery and honesty of their hunters, others wax poetic about the thrill and exhilaration of seeing hounds spread out across a fall meadow while others admit that a near miss was averted, last second, thanks to a timely grab at a hunk of mane. And, the best part is that next week, riders, horses and hounds can do it all again! Fill a tall, 12-ounce glass with ice and add gin and lemonade. Top with 7UP and garnish with a slice of cucumber.